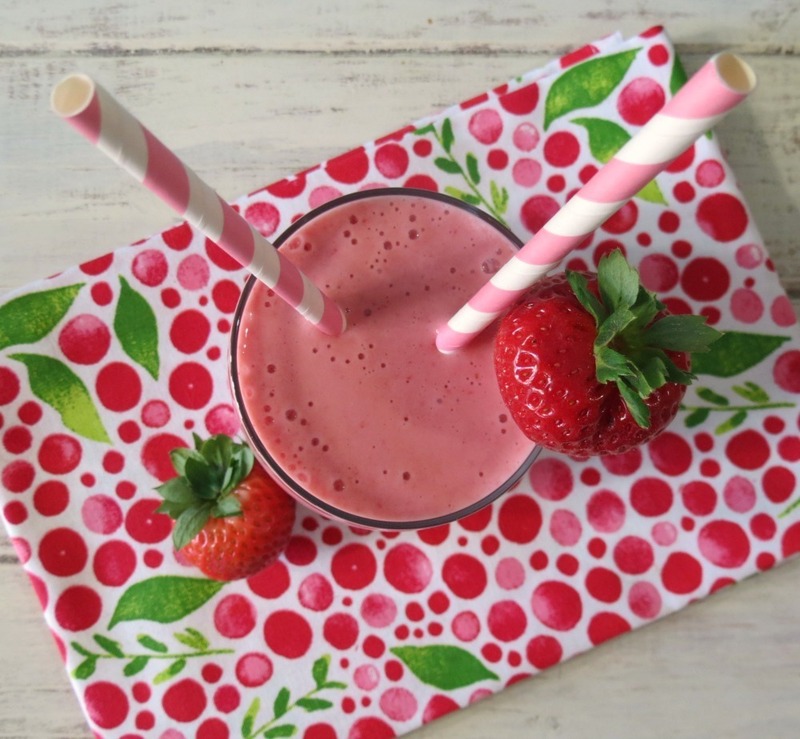 Today I am sharing with you the last smoothie of the year! 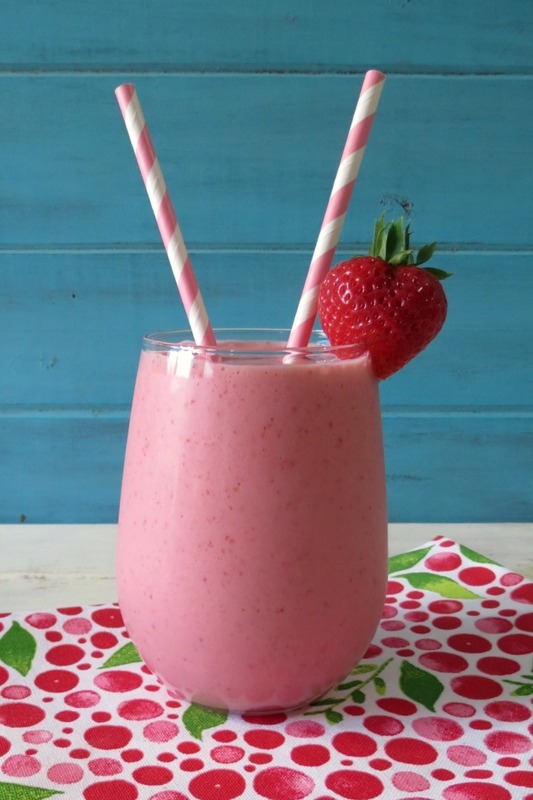 It’s a sweet one, healthy, low-calorie and made with my favorite fruit, strawberries! I just love strawberries and I haven’t really had anything made with strawberries in a long time. This smoothie has it all! A wonderful strawberry flavor, a pop of orange and it’s oh so creamy smooth!! It’s perfect for me to say goodbye to 2013! When making this smoothie my blender took a crapper on me. Sigh… I have a Ninja blender which worked like a dream until I made this smoothie. I guess I need to invest in a new blender, I’m thinking the Vitamix. It seems like that blender makes everyone pretty happy. I am disappointed because this blender only lasted me a couple of years. Lucky I have a back up blender so I can make today’s smoothie. Otherwise I would have been pretty upset. This smoothie is made with a blend of orange juice, coconut milk, greek yogurt and a pinch of stevia to sweetened it up. It’s all great ingredients and full of protein and fiber. This smoothie is very filling too!!! 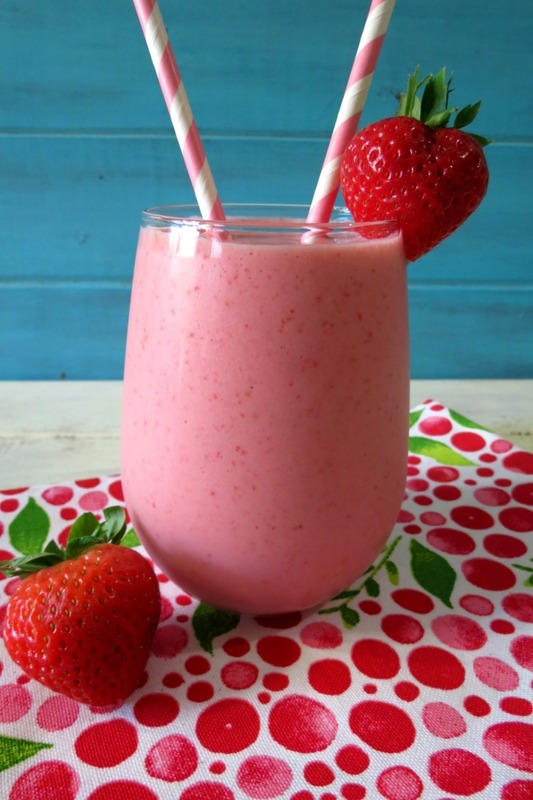 A creamy, healthy, gluten free smoothie made with strawberries, orange juice and greek yogurt. I thought I would give you a little health update. I went to the doctors and got my lab results for finding out if I am lactose intolerant. I was tested for Celiac, lactose and fructose. I got a negative on everything, which is a good thing. What the doctor found is that I have a bacterial over-growth in my intestine. That is what caused the empty feeling in my stomach, weight gain and the bloating. The doctor put me on antibiotics for 10 days. He said this will re-boot my system. I all ready feel great and my stomach has flattened out! Yah! I lost 5 lbs in two days taking the antibiotics. It goes to show how much I was bloated! So I am happy to report that I can have dairy again! However, I am going to limit my intake of it. I am also going to limit my intake of carbs too. I want to start 2014 on a good health note, so I am going to up my protein, eat more vegetables and limit my fruit to a couple of servings a day. I think I was really over-doing the fruit. I am not sure what caused the infection, but now I need to keep an eye on what I am eating. I think to much of anything is not good, including healthy food. Yes, I said that, but it’s true. Will that mean, I’ll eat junk? Of course not! My body is a machine and I need to keep it fueled with good things! So that’s it for me! Have a great day and Happy Smoothie Monday! So glad to hear your health problems are starting to clear up!! Also, this smoothie looks awesome. Such a great way to start off 2014! Thank you Joanne! Yup, going into 2014 with a better outlook and healthier recipes. Thank you Marie! I do feel so much better! Happy 2014 to you!! Great that you’ve hit the reset button and can start working on some new goals. Really appreciate all your yummy recipes and your balance of health and treats. If you can splurge, get the Vitamix. I bought one about six months ago and it has been the best kitchen investment I ever made! Always working on goals, but I’m going to try harder this year. I am thinking of a Vitamix, I just have to save up a little. Love this combination of flavors Jennifer, so sweet and fresh. So happy to hear your health news, it’s always so good when they can figure out what the problem is. I know it makes your life a lot easier not having to completely limit the dairy and gluten. Happy New Year! Thank you so much Chris! Happy New Years to you too!! Smoothies are the best! I killed my old blender awhile back – I think it’s the frozen bananas in smoothies. I am thinking about a Vitamix, but truthfully my food processor has been doing an amazing job! Glad you are feeling better. I eat tons of fruit and hope that’s not a bad thing. Maybe I should up my vegetable intake! This is a perfect smoothie combination! So glad for you their wasn’t a major dietary issue and antibiotics are working! Thank you so much Anna! I am so happy too! I feel so much better!! 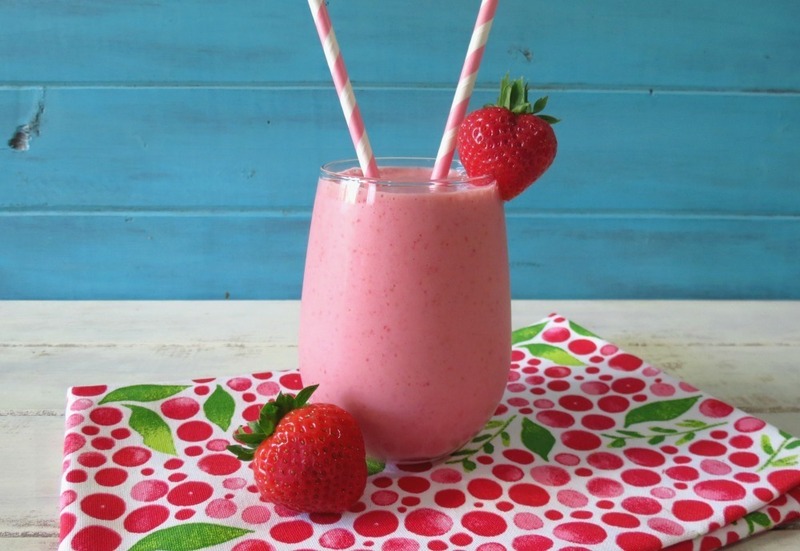 I love a great strawberry smoothie, especially with orange! Big yum! Healthy and yummy! Great way to start a new year. Thanks for linking to What’d You Do This Weekend. Happy New Years to you too!! Glad you are feeling better! This smoothie sounds so perfect right now. I love strawberry anything! Side note, I’ve heard from a few people that the Vitamix was one of their favorite purchases. We don’t have one just yet, but plan to. Just wanted to stop by to thank you for sharing and linking up to What’d You Do This Weekend and I will be featuring this later tonight in this week’s linkup. Have a great night! Thanks Ashley! I think I need to get a Vitamix, but I just need to save my pennies. I’ll use the back-up crappy blender for the time being! Sigh.. Thank you for having me at What’s You Do This Weekend! Glad to hear you’re feeling better! This smoothie sounds phenomenal! Pinned – Thanks for linking up to Freedom Fridays! Yay! I can’t wait for summer time so I can have fresh fruits to start with my smoothies. I’m stopping by from Pinterest, where I’m a new follower. Thanks for sharing! Hi Leslie!! Welcome to PB and P!! I know I am excited for summer too! I love when berry season comes, which should be in a couple of months! Woohoo!! I am so glad you liked it. Thank you for letting me know. Hello, I have tried this recipe several times in the last couple of weeks, and i used almond milk instead of coconut, (which I think might have altered the flavor) and plain greek yogurt. I have found that this tastes best (for my taste buds, which I like things really sweet) to use the 100 calorie yoplait (or which ever brand that is fat free) strawberry flavored greek yogurt. It has just the right amount of sweetness (there again, for me). I LOVE it! I hope this helps someone! And thanks for sharing your recipe! Thank you so much Lori! I bet it tasted good with the yoplait! I’ll have to try it with flavored yogurt. This looks and sounds delicious! 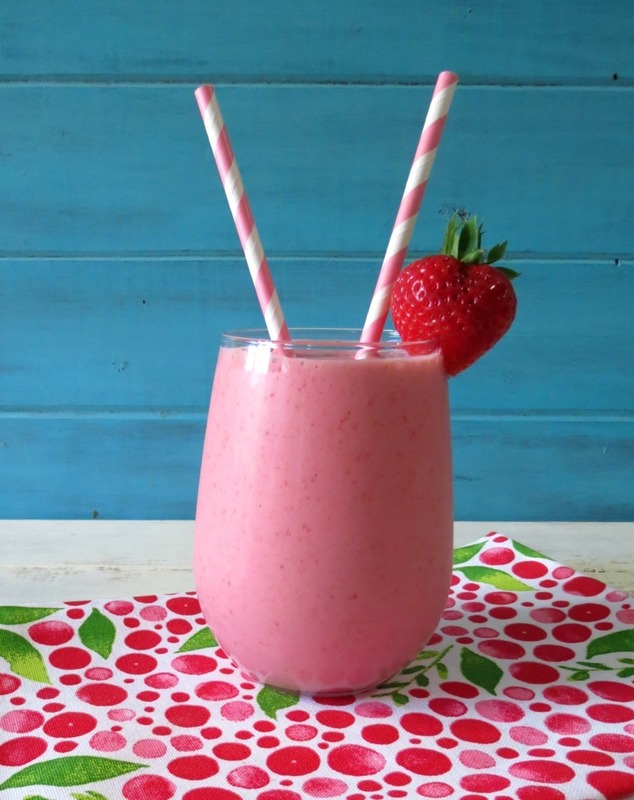 And with just 5 weight watchers smartpoints, I’m totally into this smoothie!!! Perfection! Thanks for sharing this.